We are delighted to have published the first ever NHS Newborn and Infant Physical Examination (NIPE) Screening Programme Handbook, which informs practitioners who carry out the NIPE examination and supports best clinical screening practice. 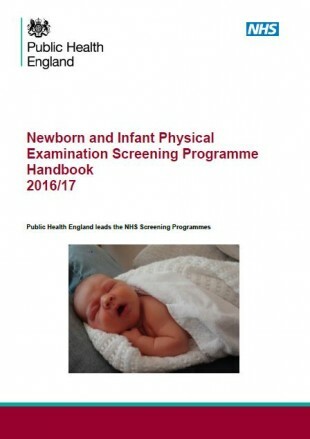 This new guidance document (right) covers the screening elements undertaken as part of the head-to-toe newborn and 6-8 week examination of the baby. The NIPE team took into account valuable input from clinical experts and other stakeholders when putting together the new handbook. It is a comprehensive document that includes useful background information such as incidence rates, associated risk factors, good practice points when undertaking the NIPE examination, and information on screen negative and screen positive pathways. Previous standalone programme statements have been reviewed and incorporated, along with a handy summary of the programme standards and NIPE key performance indicators (KPIs). The handbook will be reviewed at least annually. We would welcome any feedback on its content via email to the PHE Screening helpdesk.